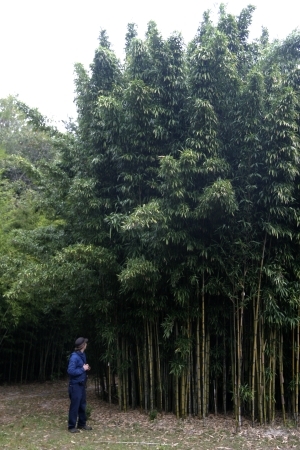 There are many types of bamboo species to decide from. Making a wise decision will help to minimize your future maintanence cost's of your home landscape. There are two main types of bamboo running and clumping. Culm - The stem, stalk, that straight upright rigid piece of bamboo. Branches grow from the culms along with leaves, collecting light and transpiring. Rhizome - The roots, a horizontal underground stem sending out more rhizomes and shoots (new culms) from its nodes. Smaller feeder roots grow from the rhizomes, drinking water and nutrients. Bamboo rhizomes really only grows in the top 8 inches of soil. Height 15-30 feet avg. Invasive rhizomes Yes needs more maintenance. Culms can get thick, sometimes up to 3". Lots of sizes, shapes, & colors to choose from. Height 6-15 feet avg. Invasive rhizomes No needs less maintenance. Culms stay somewhat small usually 1/2". Limited sizes, shapes, & colors to choose from. At Bamboo Rescue Plants can be purchased, but you have to make an appointment for a visit in person. There is no shipping available. However local delivers can be done. Most of the time these plants are sold for installions and the Bamboo Containers we build. The picture on the left is a running bamboo. It's name is Semiarundinaria fastuosa, the common name is Temple bamboo. Here we see Noah Bell observing. This bamboo is known for its small branch length and very upright habit, also it's ability to make a grove (hence the term running). It is commonly used in chinese gardens, especially temple complexes. The picture on the right is a clumping bamboo. It is in the genus of Bambusa. 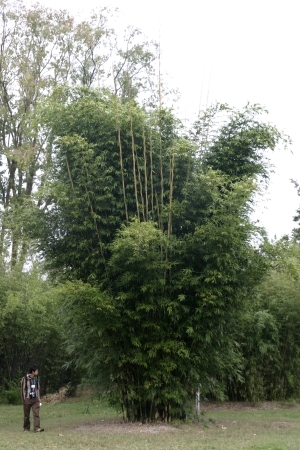 It is a tropical bamboo that will not grow in the NW climate. However since it is a clumping bamboo it has the same habit as all the rest of the clumping bamboo's. Notice the base has not spread out like the running bamboo's. Please locate your nearest bamboo grower. They will also know what grows best in your climate.